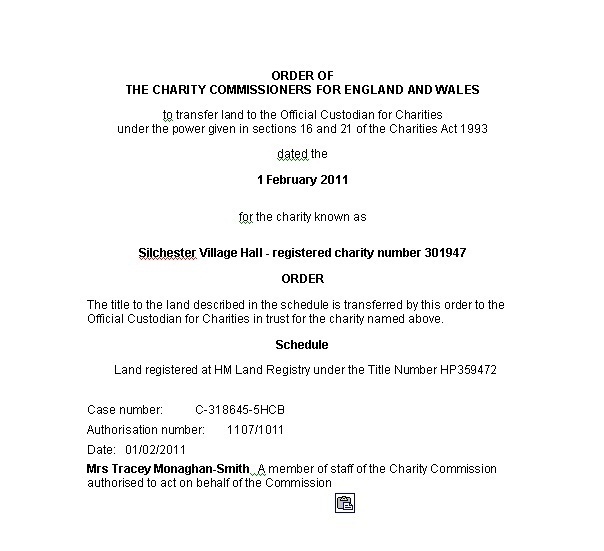 Silchester Village Hall is a Charity registered under No. 301947 and as such is regulated by the Charity Commission, the regulator of all charities in England and Wales. Until the 24th November 2011, the Village Hall had been operated in accordance with the terms set out in a Deed of Trust and Conveyance, signed in 1927. Since 1927 there have been numerous and substantial changes in UK Charity Law – many of which now over-ride the terms of the original Deed of Trust and Conveyance. Following a general recommendation from the Charity Commission that the effectiveness of our “governing document” should be regularly reviewed and the realisation that the then existing two-tier management structure was badly out of date and cumbersome, the then Trustees took the opportunity to draft new administrative powers and procedures set out in Schedule A, which provides best practice and is based on a template obtained from ACRE (Action With Communities in Rural England). In order for these changes to be put into effect, a general meeting of not less than 20 residents of Silchester had to be convened to consider and a Resolution under section 74D of the Charities Act 1993 to be accepted deleting the Trust Schedule and the Second Schedule of the 1927 Deed of Trust and Conveyance and replacing this with Schedule A. The then Trustees convened a general meeting in Club Room of the Village Hall on the 25th July for this purpose. In the event, the Club Room was far too small for the unprecedented numbers that attended, and the then Trustees had allowed two versions of the proposed new governing document to have been circulated prior to the meeting. In the ensuing chaos, the Chairman had to adjourn the Meeting, which was duly reconvened in the Village Hall on the 24th November. At the reconvened General Meeting of the Inhabitants of Silchester called by the Trustees re-convened and held on the 24th day of November 2011, a resolution made under section 74D of the Charities Act 1993 (as amended 2006) was passed to the effect that the provisions of the first (Trust) and second schedule of the Deed of Trust and Conveyance dated 18 June 1927 be amended by the deletion of the first (Trust) Schedule entirely; by the deletion of the Second Schedule entirely and by the replacement of the Second Schedule with Schedule A - Version 7 dated October 2011. Subsequently the following 10 Managing Trustees were nominated unopposed:-. 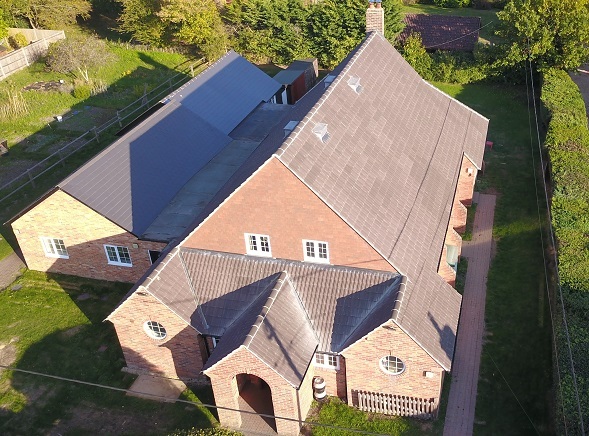 In accordance with best practice the land “owned” by the Silchester Village Hall Charity is vested in the Official Custodian for Charities in trust for Silchester Village Hall Charity. The Official Custodian is an official appointed by the Charity Commission. An Order to effect this change, dated 1st February 2011, was issued by the Commission under the power given in sections 16 and 21 of the Charities Act 1993. *Those in the “area of benefit” are defined as all residents of the parish of Silchester and that area that lies within half a mile outside the boundary of the parish of Silchester provided always that the area to the west of the parish within Pamber Heath shall be restricted to those properties on Impstone Road fronting the common and fronting Silchester Road up to the Clappsgate turning. All bookings and enquiries should be made to Vivienne Hartshorn on 01189 700940. At present we are unable to take bookings or enquiries by email.